Their technology was peculiar in that everything, from tools to structures is not constructed, but "grown", each device being therefore organically unique. The Gungans' native technology, therefore, seems to be completely well-aligned and friendly to the Yuuzhan Vong's pro-organic, anti-inorganic culture. 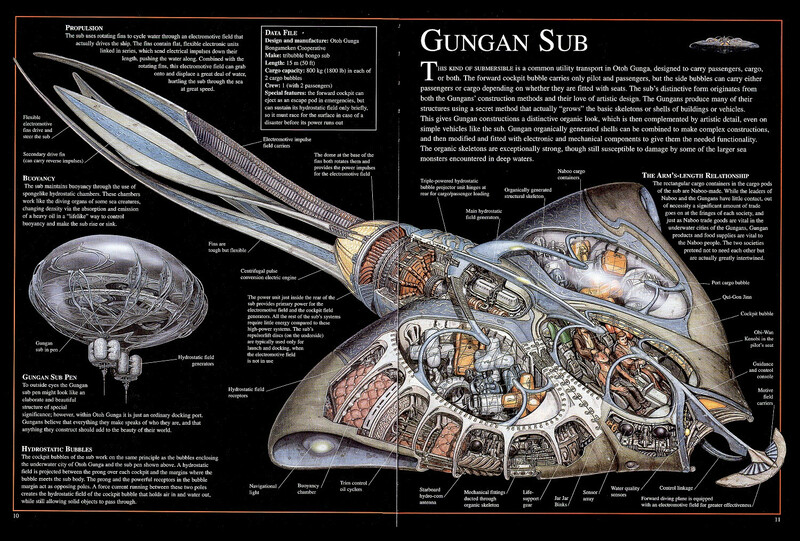 Do we know anything about the Yuuzhan Vong's actual perception of Gungans and their technological culture? Although there are no in-canon references to the Gungans encountering the Yuuzhan Vong, the reality is that they would have probably been just as appalled by them as they were with the other machinery-obsessed races they found within the Galaxy far far away. Not only do the Gungans regularly trade plasma with the outside world (used to power machines and droids) but they also marry their organic technology with equipment and machinery they've purchased from offworld traders. The Gungans produce many of their structures using a secret method that actually "grows" the basic skeletons or shells of buildings or vehicles. This gives Gungan constructions a distinctive organic look, which is then complemented by artistic detail, even on simple vehicles like the sub. Gungan organically generated shells can be combined to make complex constructions, and then modified and fitted with electronic and mechanical components to give them the needed functionality. The organic skeletons are exceptionally strong, though still susceptible to damage by some of the larger sea monsters encountered in deep waters. How were the Naboo and Gungans symbiotic?